This shouldn’t even be a draft, but I’m going to publish it as a reminder. DABDA (1969): Denial – Anger – Bargaining – Depression – Acceptance. Dr. Elisabeth Kübler-Ross framed processing news of a fatal diagnosis in stages of shock, denial, anger, bargaining, and depression (with parallel tracks of hope) as a sort of stairway to acceptance. (This frame, if I recall correctly, was to inform care providers who might support the patient better with an understanding of the steps involved.) Other people have called it a rollercoaster, with some stages more short or long or profound in their effects, with looping back to previous sections, but the author noted that it was not a linear process. Acceptance isn’t necessarily final but is potentially long-lasting, as there is no going back from death. Scientific Change Results from Paradigm Change (1962) : Pre-Paradigm; Normal Science; Crisis Period; Paradigm Shift; New Normal. Dr. Thomas S. Kuhn wrote The Structure of Scientific Revolutions to describe the history of change in the scientific community. Pre-Paradigm (multiple incomplete and possibly incompatible theories, with no common body of agreed-upon facts); Normal Science (dominant paradigm / consensus covers everything, but unexplainable anomalies accumulate to show weaknesses of paradigm); Crisis Period (unaccountable anomalies stress people out; Normal Science tries to resolve; if it fails, move to the next phase); Paradigm Shift (old, deep assumptions are questioned and a new paradigm is established); Post-Revolution (new paradigm becomes Normal Science.) Wash, rinse, repeat. This framework of understanding is very important to me, since I grew up in a rural area that used to admire science as a way to breed healthier livestock and produce blight-free crops with high yield…but later were convinced that science is a liar, or at best Not All That It’s Made Out To Be, because it conflicts with the Bible and conflicts with itself and things get disproven. Sigh. Stage of Change Model (Transtheoretical Model, 1983): Pre-Contemplation; Contemplation; Preparation; Action; Maintenance; Relapse. Prochaska and DiClemente conceptualized the model of change (intentional behavior change) as stages: Not Ready to change (unaware of problem); Getting Ready to change (aware of problem); Preparation (figuring out how to approach solution); Action (making a change); Maintenance (sustaining a change); Relapse (action / change was not fully effective; time to learn lessons from failure and try again.) Wash, rinse, repeat. This model of change is like a personal version of Kuhn’s paradigm shift process, with the emphasis on its spiraling nature, with relapse an essential part of growth, for those of us who do not make a single correction to perfection. These are stages of change, not development, so I’ll wait, for the time being, to integrate these essentially very similar process models into a plan of action related to stages of development. Development of self is not a primarily corrective process, but one of evolution, or becoming something new. Each stage has tasks and challenges that must be met for complete growth into the next phase, to meet those new tasks and challenges in a state of preparation and readiness. This model means so much to me because in addition to being fascinated by ego psychology, I am a big fan of attachment theory. The earliest lessons we learn about whether the universe is safe; where and when we can trust others, ourselves, and the world; and the importance of consistency and reliability — things being reliably “good enough” to sustain confidence that all is well and will continue to be so — i.e., hope. A thing I would ultimately like to address is the neglected or overlooked process of aging, which is condemned here to a “65+” realm. Many of the Norwegian prairie farmers in my family stayed compos mentis into their late 90s / early 100s. 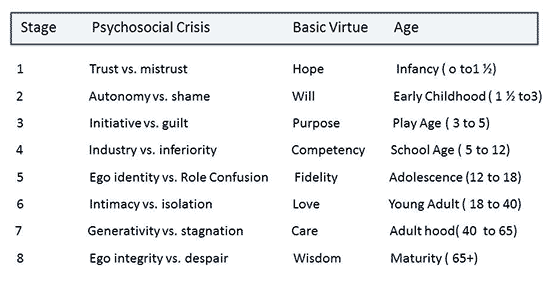 I know the first five stages occur before early adulthood, and there is much less change in late adulthood, but shoving older adults in a single box marked “Wisdom” is not sufficient. But right now Honey wants to take out the trash, and I need to make breakfast, and oh god how long have I been typing? Another day, another distraction.